Buckingham's rebellion was a failed but significant uprising, or collection of uprisings, of October 1483 in England and parts of Wales against Richard III of England. To the extent that these local risings had a central coordination, the plot revolved around Henry Stafford, 2nd Duke of Buckingham, who had become disaffected from Richard, and had backing from the exiled Henry Tudor (the future king Henry VII) and his mother Margaret Beaufort. Rebels took arms against the king, who had assumed power from Edward V in June of that year. They included many loyalists of Edward V, and others who had been Yorkist supporters of his father Edward IV. Seven ships from Brittany carrying over 500 Breton soldiers, Henry Tudor, and many of his supporters were to have risen simultaneously against Richard III. A gale prevented this planned landing from being successfully carried out, and in England a premature uprising in Kent forewarned Richard that Buckingham had changed sides. When his brother King Edward IV died in April 1483, Richard of Gloucester was named Lord Protector of the realm for Edward's son and successor, the 12-year-old Edward V. As the young king travelled to London from Ludlow, Richard met and escorted him to lodgings in the Tower of London, where Edward V's own brother Richard of Shrewsbury joined him shortly afterwards. Arrangements were made for Edward's coronation on 22 June 1483; but, before the young king could be crowned, his father's marriage to his mother Elizabeth Woodville was declared invalid, making their children illegitimate and ineligible for the throne. On 25 June, an assembly of Lords and commoners endorsed the claims. The following day, Richard III began his reign, and he was crowned on 6 July 1483. The young princes were not seen in public after August, and accusations circulated that the boys had been murdered on Richard's orders, giving rise to the legend of the Princes in the Tower. In late September 1483, a conspiracy arose among a number of disaffected gentry, many of whom had been supporters of Edward IV and the "whole Yorkist establishment". The conspiracy was nominally led by Richard's former ally and first cousin once removed Henry Stafford, 2nd Duke of Buckingham, although it had begun as a Woodville-Beaufort conspiracy (being "well under way" by the time of the duke's involvement). Indeed, Davies has suggested that it was "only the subsequent parliamentary attainder that placed Buckingham at the centre of events", in order to blame a single disaffected magnate motivated by greed, rather than "the embarrassing truth" that those opposing Richard were actually "overwhelmingly Edwardian loyalists". 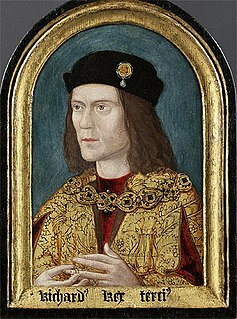 It is possible that they planned to depose Richard III and place Edward V back on the throne, and that when rumours arose that Edward and his brother were dead, Buckingham proposed that Henry Tudor, Earl of Richmond should return from exile, take the throne and marry Elizabeth of York, elder sister of the Tower Princes. The Lancastrian claim to the throne had descended to Henry Tudor on the death of Henry VI and his son Edward of Westminster in 1471. 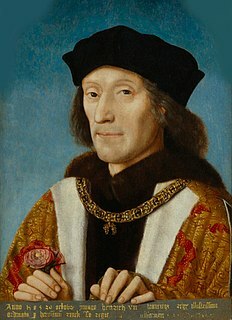 Henry's father, Edmund Tudor, 1st Earl of Richmond, had been a half-brother of Henry VI, but Henry's claim to royalty was through his mother, Margaret Beaufort. 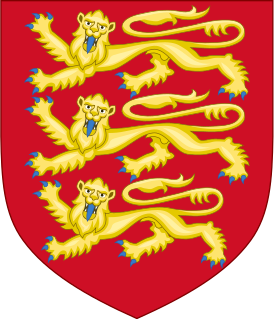 She was descended from John Beaufort, who was a son of John of Gaunt and thus a grandson of Edward III. John Beaufort had been illegitimate at birth, though later legitimised by the marriage of his parents. It had supposedly been a condition of the legitimation that the Beaufort descendants forfeited their rights to the crown. Henry had spent much of his childhood under siege in Harlech Castle or in exile in Brittany. After 1471, Edward IV had preferred to belittle Henry's pretensions to the crown, and made only sporadic attempts to secure him. However his mother, Margaret Beaufort, had been twice remarried, first to Buckingham's uncle, and then to Thomas, Lord Stanley, one of Edward's principal officers, and continually promoted her son's rights. Buckingham's precise motivation has been called "obscure"; he had been treated well by Richard. The traditional naming of the rebellion after him has been labelled a misnomer, with John Morton and Reginald Bray more plausible leaders. Henry, in exile in Brittany, enjoyed the support of the Breton treasurer Pierre Landais, who hoped Buckingham's victory would cement an alliance between Brittany and England. Some of Henry Tudor's ships ran into a storm and were forced to return to Brittany or Normandy, while Henry himself anchored off Plymouth for a week before learning of Buckingham's failure. For his part, Buckingham raised a substantial force from his estates in Wales and the Marches. Buckingham's army was troubled by the same storm and deserted when Richard's forces came against them. Richard in the field defeated the rising in a few weeks. Buckingham finds the River Severn swollen after heavy rain, blocking his way to join the other conspirators. Buckingham tried to escape in disguise, but was either turned in by a retainer for the bounty Richard had put on his head, or was discovered in hiding with him. He was convicted of treason and beheaded in Salisbury, near the Bull's Head Inn, on 2 November. His widow, Catherine Woodville, later married Jasper Tudor, the uncle of Henry Tudor, who was in the process of organising another rebellion. In military terms it was a complete failure. It did, however, deepen the opinion of many towards Richard as king, and its effect over the next few months was to drive a number of leading figures into Henry Tudor's camp. Five hundred Englishmen slipped through the King's net and found their way to Rennes, the capital of Brittany, where in desperation or fresh expectation they forged an alliance with the Earl of Richmond. The failure of Buckingham's revolt was clearly not the end of the plots against Richard, who could never again feel secure, and who also suffered the loss of his wife in March 1485 and eleven-year-old son in April 1484, putting the future of the Yorkist dynasty in doubt. Richard made overtures to Landais, offering military support for Landais's weak regime under Duke Francis II of Brittany in exchange for Henry. Henry fled to Paris, where he secured support from the French regent Anne of Beaujeu, who supplied troops for an invasion in 1485. Henry gained the support of the Woodvilles, in-laws of the late Edward IV, and sailed with a small French and Scottish force, landing in Mill Bay, Pembrokeshire, close to his birthplace on 7 August 1485. He defeated and killed Richard during the battle of Bosworth Field on 22 August and subsequently became king of England under the name of Henry VII. Thomas Grey, 1st Marquess of Dorset Westminster Abbey in sanctuary as Richard took the throne, Yorkshire, Exeter Constable of the Tower of London for Edward V Openly supported Henry of Richmond in Exeter. Joined Richmond in Brittany. Edward Courtenay South-west England Commission of the peace in Cornwall He went Brittany, and was attainted in 1484. He took part in the battle of Bosworth, and was created Earl of Devon by Henry VII. John Fogge Kent Chamberlain Liaison between Guildford and Bray Attainted after the rebellion; restored in February 1485. Amias Paulet Somerset, south-west England Landowner Attainted after the rebellion; restored in 1485. John Cheyne Rebel leader in Salisbury. Richard Hill Diocese of Salisbury, southern England Cleric Probable support of local rebels. Suffered loss of income; may have become a supporter of Richmond at this point. Walter Hungerford of Farleigh Wiltshire Rebel leader Pardoned, confined briefly to the Tower of London. John Morton In Buckingham's custody in Brecon Castle Bishop of Ely, conspirator Planning Attainted, escaped to Flanders, pardoned December 1484 but went to Rome. Thomas Nandyke At Brecon with Buckingham and Morton. Astrologer He took part in a later revolt against Richard around Colchester, and was outlawed. Reginald Bray North-west England and Wales Conspirator and go-between Liaison between Morton and Margaret Beaufort. Recruited Daubeny, Cheyne, Richard Guildford. Pardoned January 1484. Ralph de Ashton Vice-constable of England. Defended London for the king. Rewarded with land in Kent. John Howard, 1st Duke of Norfolk Military commander Defended Kent for the king. Killed at the Battle of Bosworth on the king's side. ^ Christine Carpenter (13 November 1997). The Wars of the Roses: Politics and the Constitution in England, C.1437–1509. Cambridge University Press. p. 212. ISBN 978-0-521-31874-7. Retrieved 5 April 2013. ^ Ronald H. Fritze; William Baxter Robison (2002). Historical dictionary of late medieval England, 1272–1485. Greenwood Publishing Group. p. 77. ISBN 978-0-313-29124-1. Retrieved 5 April 2013. ^ Bosworth: The Birth of the Tudors; Phoenix Press; 2013; pp. 153–4 Recorded by Polydore Vergil. ^ a b c Stephen, Leslie; Lee, Sidney, eds. (1890). "Grey, Thomas (1451-1501)" . Dictionary of National Biography. 23. London: Smith, Elder & Co.
^ a b Lee, Sidney, ed. (1895). "Paulet, Amias (d.1538)" . Dictionary of National Biography. 44. London: Smith, Elder & Co.
^ Ford, David Nash (2010). "John Cheney (c.1442–1499)". Royal Berkshire History. Nash Ford Publishing. Retrieved 29 November 2010. ^ a b Douglas L. Biggs; Sharon D. Michalove; Albert Compton Reeves, eds. (2004). Reputation and Representation in Fifteenth Century Europe. BRILL. p. 281. ISBN 978-90-04-13613-7. Retrieved 5 April 2013. Sir William Brandon of Soham, Cambridgeshire was Henry Tudor's standard-bearer at the Battle of Bosworth, where he was killed by King Richard III. He was the father of Charles Brandon, 1st Duke of Suffolk.